Our girls are excited to start on advancement, undertaking their journey to the Eagle Scout rank, and we're looking forward to more girls joining the troop in the future. Our latest adventure was this very weekend. The Scouts participated in the Flintlock District's Grand Klondike Derby at Camp Sayre in Milton, competing in events like fire building, tomahawk throwing, and orienteering. Boys and girls alike are looking forward to snowshoeing to the Lonesome Lake Hut in the White Mountains in March and cycling 50 miles on Cape Cod in May. Troop 103 meets once a week, on Tuesdays from 7pm-8:30pm at Fox Hill School in Burlington. Any boys or girls in grades 6 through 12 and their parents are welcome to come to a meeting, and talk to the Scoutmaster about Troop 103. If you have any questions, you can contact the Scoutmaster, Steve Green, at troop103burlington@gmail.com. You can also read the Spirit of Adventure Council's newsletter about the launch of Scouts BSA and girls in Scouting. It's common sense that climbing a mountain isn't going to be easy, but it is a rewarding experience. The climb up Mt. Monadnock was steep and it took a few hours to even get close to the top, but the view once we got there was absolutely stunning. We ate lunch on the rocks above the clouds and managed to crawl our way down just in time for dinner. Along with cooking our own meals for dinner that night and breakfast the next morning, some of the new scouts also got requirements signed off on after learning numerous safety necessities. Overall, the Monadnock trip was a difficult one, but one that was very worthwhile. BCAT interview of two of our Scouts, Ethan and Jenna. Check it out in this Truck Day Interview! Summer Camp, like every year was a blast. This year the camp ran a little bit differently than usual, all meals were served family style, grace was indoors, and patrols picked their activities rather than picked by the SPL. Some activities included survival bracelet making, Water Trampoline (with a new added slide and spinning log), Cope and Climbing, and more. Four of our new scouts joined us for their first summer camp ever. Jayden, Ronan, Joe, and Noah. The boys were a little homesick, but loved being there and want to comeback next summer. Our troop did some amazing things. At the closing ceremony it was announced that we won 3rd place in the McGee Cup, and our very own Cam Hudson completed the Mile Swim for the 2nd year in a row. Aaron Rippin presented a sign for our troop to be hanged in the dining hall. The back of the sign carried the signatures of everyone who attended the camp out this year. Over the weekend, the troop snowshoed up Cannon Mountain. They followed a 1.6-mile trail and crossed the frozen lake, all while carrying packs and dragging sleds. This was all done in below freezing temperatures and with 16 mph winds. The hike took over two hours, but was a lot of fun. The scouts stayed in unheated cabins with a heated dining area next door. After lunch, the scouts went off to participate in activities. A few scouts and scoutmasters hiked up the Lonesome Lake trail to Kinsman Ridge and sledded back down. Meanwhile, the remaining scouts sledded and built igloos in front of the lodge. Later that night, the scouts enjoyed pasta and salad and played games. After a cold night, the scouts quickly made breakfast burritos and packed up to leave. After cleaning up, they snowshed and sledded down, with a record of twenty minutes to the bottom. Every year, the scouts go the Boston Rock Gym located in Woburn, Massachusetts. There everyone can have a great time with all the different climbing activities. At the rock gym there is a variety of walls to climb, ranging from an easier wall for beginners to a more difficult wall to fit for a more experienced climber. The boys can also try angled wall for a new challenge. They also have a rotating wall to test stamina and provides a nonstop climb. The scouts look forward to and enjoy the rock gym and we plan to go visit next year. Recently, the scouts went to the Echo Enrichment Center in Burlington to help the students there build their own ginger bread houses! They spent many hours assisting and preparing for them to plan, draw and execute building their own sugary structures. They had lots of fun and they enjoyed the scouts company as they usually do. We are happy that they like having us return every year! From Saturday, November 18 to Sunday, November 19, Troop 103 held its annual turkey feast campout, a festive gathering where scouts, families and friends devour a plethora of thanksgiving foods. An impressive ninety-plus people were fed this year, some food items including six turkeys, thirty pounds of potatoes, twenty-five pounds of corn, and fourteen homemade apple pies. This was all prepared by the scouts outdoors in the bitter temperatures of Saturday morning before our feast around four o’clock. By Sunday, the scouts had an impressive pile of equipment to clean up, but pushed through ahead of schedule and headed home after another successful campout in the books. You can check out the photos here. This past weekend, the scouts participated in what is known as the Scout-O. The scout-O is an annual event where the scouts have to use a map and compass to find their way around a course in a competition with other troops.. There, we had 3 events, the practice, the night-O, and the actual competition. Many of the scouts did very well tracking down and getting the control points. This was a very fun weekend with the competitive atmosphere, the people involved, and the great meals made by the scouts. You can see the photos from that here. 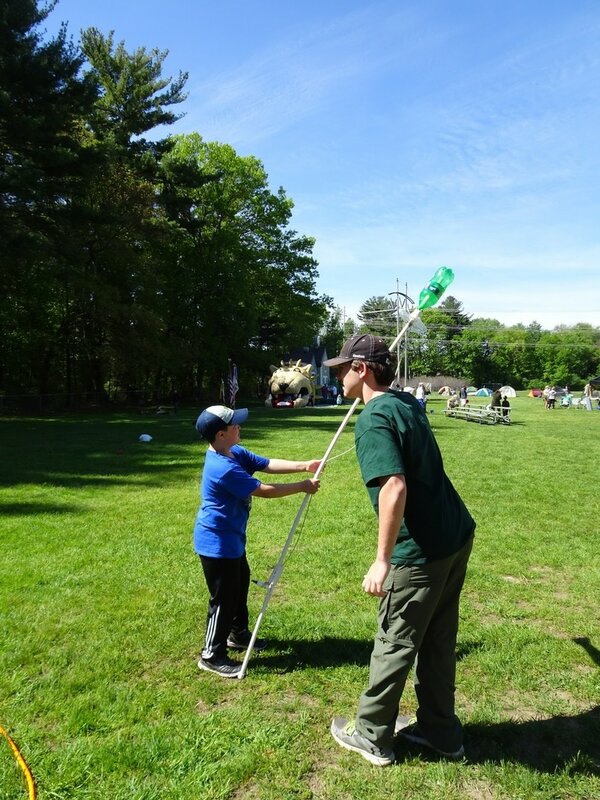 On September 31, Troop 103 returned to Mount Monadnock for it’s annual shakedown campout. This year’s trip presented some challenging conditions, as there was some cold weather and some light rain on Saturday while hiking up the mountain. The peak presented some challenges of it’s own, as the temperature dropped considerably along with visibility. Thankfully, conditions improved as we returned to our campsite. After our tiring trip to the summit and back, we decided to start making a campfire and cooking dinner, which took the majority of the remaining day. Exhausted, we went to bed proud of our accomplishment. The following morning, we cooked breakfast and started packing troop gear. After ending our trip with a review of what we could have done better, what we should start doing, and what we did well, we headed for home, having put another successful campout in the books. As the beginning of the scouting year arrives, Troop 103 ventured once more to the town common for our annual fundraiser at truck day. Being our biggest fundraiser of the year, truck day is essential to having fun and adventurous campouts, as well as other exciting festivities during the scouting season. This year’s successful sales of popcorn, candy, and mostly water provided over one thousand dollars of funds for the troop, making it our most profitable truck day ever! This money may help to provide some new equipment for the troop, as well as fund some exciting campouts during the year. 22 scouts, including 3 of our newest members attended summer camp for a week at Camp T.L. Storer in Barnstead, NH during the second week of July. As always, the scouts had a great time with all the usual summer camp activities. From swimming and boating to firing shotguns and rifles to horseback riding to yelling in the dining hall, we did it all! It's been great to see our scouts mature and grow year after year. It was also pretty sweet to hoist the McGee cup for winning the camp-wide relay race! Take a look at all the photos in the gallery. This year the scouts marched in the annual 4th of July parade in Burlington. We walked about 2 miles from the church on Cambridge street up to Memorial School on Winn street. We needed lots of water but the dog kept us happy and motivated. There were many people there cheering us on and many joining us in the parade. In the end all of us returned with our hearing intact despite the musket shots every few minutes. This year the scouts attended the annual crossover at Rahanis Park! On the night of, they helped the younger scouts cross over into troops and level up within their packs. Afterwards, they played glow in the dark capture the flag, and went to bed. The next day, they made breakfast and started participating in fun activities such as bottle rockets and capture the flag! Check out the pictures here! One of the most memorable events of the week in Washington, D.C. was the wreath laying ceremony at the Tomb of the Unknown Soldier in Arlington National Cemetery. Here is a short video of the ceremony. Thirteen scouts from the troop spent an amazing 5 days in Washington, D.C. during April vacation. You can read more about the trip in our blog and see pictures of it in the photo gallery. Welcome to the online home of Troop 103! We are an active Scouts BSA Troop in Burlington, MA, which is part of the Flintlock district in the Spirit of Adventure council. Read more on our About page.